2002-07-06. New. Ships with Tracking Number! INTERNATIONAL WORLDWIDE Shipping available. Buy with confidence, excellent customer service! Crown Publishers, New York: 2001. Hardcover with dustjacket. Very good condition. Mention of Scotland and the Scots usually conjures up images of kilts, bagpipes, Scotch whisky, and golf. But as historian and author Arthur Herman demonstrates, in the eighteenth and nineteenth centuries Scotland earned the respect of the rest of the world for its crucial contributions to science, philosophy, literature, education, medicine, commerce, and politics - contributions that have formed and nurtured the modern West ever since. Includes an Index. "This is a great book, one which is now even more relevant than ever. It deserves to be a best seller." - Michael Barone, U.S. News & World Report, coauthor of The Almanac of American Politics ISBN: 0609606352. Crown, 2001. (1st edition, 1st printing) Large, sturdy book, red covers, very bright gilt lettering on spine, 392 pages. DJ beneath mylar, colorfully designed with color-illustration of Scotsman on front and back left. DJ and book, both As New.. First Edition. Hard Cover. As New/As New. MJF Books. Hardcover. B001I8WBW8 Like New Condition. . Fine. Broadway, 2002-09-24. Reprint. Paperback. Used:Good. Broadway Books. PAPERBACK. 0609809997 Special order direct from the distributor . New. New York: Three Rivers Press. First Paperback Edition [stated]. Sixth printing [stated]. Trade paperback. Very good. viii, 472 pages. Occasional Footnotes. Sources and Guide for Further Reading. Index. Cover has minor wear and soiling. Arthur L. Herman (born 1956) is an American historian, currently serving as a senior fellow at Hudson Institute. Herman received his B.A. from the University of Minnesota and M.A. and Ph.D. in history from Johns Hopkins University. He spent a semester abroad at The University of Edinburgh in Scotland. His 1984 dissertation research dealt with the political thought of early-17th-century French Huguenots. Herman taught at Sewanee: The University of the South, George Mason University, Georgetown and The Catholic University of America. He was the founder and coordinator of the Western Heritage Program in the Smithsonian's Campus on the Mall lecture series. His book, How the Scots Invented the Modern World, was a New York Times bestseller. In 2008, he added to his body of work Gandhi and Churchill: The Epic Rivalry that Destroyed an Empire and Forged Our Age, a finalist for the 2009 Pulitzer Prize for General Nonfiction. 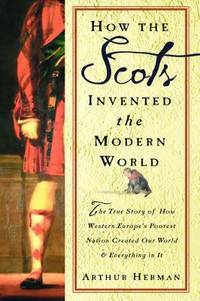 How the Scots Invented the Modern World: The True Story of How Western Europe's Poorest Nation Created Our World & Everything in It (or The Scottish Enlightenment: The Scots invention of the Modern World) is a non-fiction book written by American historian Arthur Herman. The book examines the origins of the Scottish Enlightenment and what impact it had on the modern world. Herman focuses principally on individuals, presenting their biographies in the context of their individual fields and also in terms of the theme of Scottish contributions to the world. The book is divided into two parts. The first part, Epiphany, consists of eight chapters and focuses on the roots, development, and impact of the Scottish Enlightenment on Scotland and Great Britain. The second part, Diaspora, focuses on the impacts of Scots on events, the world, and industries. Most Scots who did fight in the militias were the most capable because many were the same refugee families from the 1745 Jacobite rising. Herman claims that the Scottish School of Common Sense influenced much of the American declaration of independence and constitution. Broadway Books. PAPERBACK. 0609809997 Remainder mark . Fine. NY: Crown Publishers. Very Good+ in Near Fine dust wrapper. 2001. Seventh Printing. Hardcover. Spine ends bumped, tiny spot on top page edge (not a remainder mark). Unclipped dust wrapper has faint edgewear. A very nice copy. ; <b>'Who formed the first modern nation?Who created the first literate society?Who invented our modern ideas of democracy and free market capitalism?The Scots.<p>Mention of Scotland and the Scots usually conjures up images of kilts, bagpipes, Scotch whisky, and golf.But as historian and author Arthur Herman demonstrates, in the eighteenth and nineteenth centuries Scotland earned the respect of the rest of the world for its crucial contributions to science, philosophy, literature, education, medicine, commerce, and politicscontributions that have formed and nurtured the modern West ever since. '</b>; Image is actual copy on offer. .
Three Rivers Press, September 2002. Trade . 3.1 PB standard 50%. Three Rivers Press, 2002. Book. Good+. Large Softcover. 8vo - over 7¾" - 9¾" tall. 480pp, History of the Scots from about 1700 to the present and how they have influenced the development of the modern world. Includes many mini-biographies of famous Scots. Shelf wear and bent cover. No marks..
Broadway Books, 2002-09-24. Paperback. Very Good. Satisafaction Guaranteed!!! we ship everyday! !clean pages, no markings,excellent condition, Satisfaction Guaranteed!!! U S. A.: Three Rivers Press. As New. 2002. First Thus. Softcover. 0609809997 472pp including index The true story of how Western Europe's poorest nation created our world & everything in it . Broadway Books, 2002-09-24. Paperback. Like New. Like new copy; no marks, folds or tears to pages. MDJ. Broadway Books, 2002-09-24. 11th printing. Paperback. Near Fine. Octavo, 8" tall, 472 pages, stiff illustrated wraps. A near fine, clean, neat soft cover with light shelf wear, binding tight, paper just slightly yellowed.